Miami Beach circa 2004. See how warm and inviting it looks? Also, the entarnce is kind of shaped like a wine bottle. In 23 days I will be landing in Miami where it is expected to reach 70 degrees today as opposed to New York where today’s high is supposed to be 42 degrees. Thinking this makes me happy. 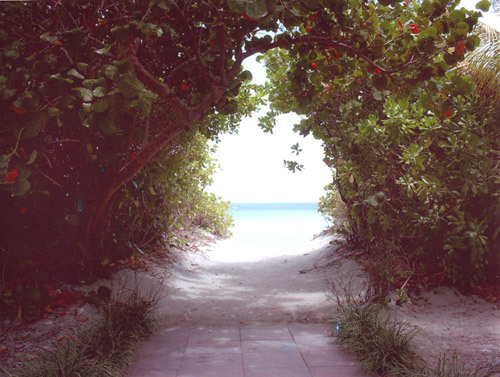 I’ve got this old photo above my computer monitor at work that I took from one of my trips to Miami Beach about eight years ago that serves as a reminder that there are warm places in winter and those warm places are serene and warm. Oh, I mentioned warm already? I do have to admit that I wimped out yesterday evening and did not go running in favor of having a brownie in the warmth of my home. But alas, this only means I absolutely must go running this evening before I have more brownies. I will be wearing my Asics beanie that you can find in the Gear section of my site. That beanie was one of the best Christmas gifts I got last year and it makes me feel all warm and snuggly when I wear it. 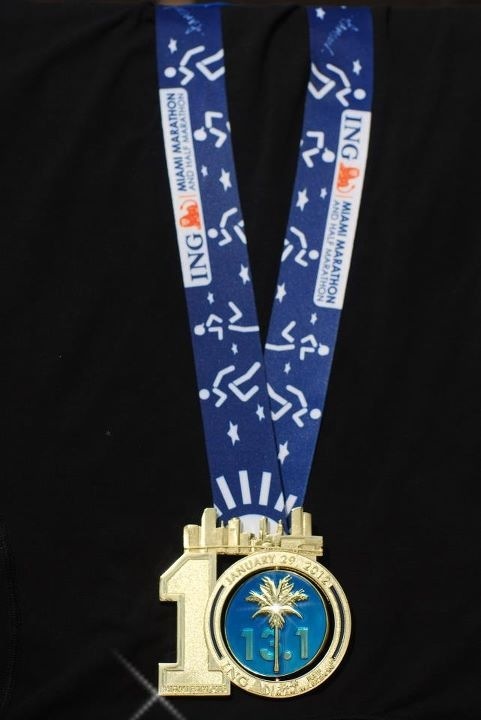 This is the medal I'll get when I finish the half marathon. That makes me happy too. Note the sparkly bling. Today also triggered my excitement for this trip. It has been about seven years since I have been to Miami and well it’s warm there. All of my travel arrangements have been made and now I’m starting to plan some of my non-running related activities which will most likely involve alcohol and a beach. My training is going well with two long runs under my belt and some speed work being added to the mix this week. In fact, tonight might be a good time to do that speed work so that I can get out of the cold faster! Thankfully, it will be warming up a bit this weekend for my 12 mile long run which will serve as my first test of where I’m pace-wise so I can assess if I’m on target for getting close that PR. I also need to start practicing my drinking technique for this trip as I desperately want to PR in that department as well. A special shout out to the person who found my site by searching, “can’t see beyond the end of one’s nose.” I don’t know what you were looking for but I’m hoping that when I hit drinking PR I won’t be able to see beyond the end of my nose. This entry was posted in Half Marathons, running, travel and tagged beach, drinking, half marathon, ING Miami Half Marathon, miami, nose, Running. Bookmark the permalink.